Ryan Anderson has been guiding for 17 years, 2 seasons in Alaska as a fly out fly fishing guide and 15 seasons here on the North Platte. Ryan has fished all over the world but truly loves his home water in Wyoming. He is a Casper native that grew up learning how to cast (in the wind) from his father and grandfather. He had a fly rod in his hand at the age of 5. By 12 he was Dennis the Menace but armed with a fly rod instead of a sling shot. The trout in the small mountain streams around Casper didn't stand a chance against this little "trout punk". 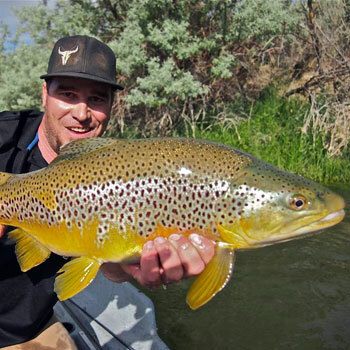 Now 35, Ryan is the owner of Wyoming Fly Fishing , Wyoming's premier guide service. Ryan enjoys the outdoors, Loves to be on the river and can always have a good time. As he puts it "I am lucky because I have been able to combine my passion with my livelihood. I knew what I wanted to do from a very young age, I wanted to Fly fish. Guiding someone into a big trout, and netting it, is the closest thing I've found to fishing myself. For me it has the same excitement, same adrenaline, everything. I love this Job!" Some one asked Ryan once what he would be if he wasn’t a fly fishing guide and he said “screwed”.